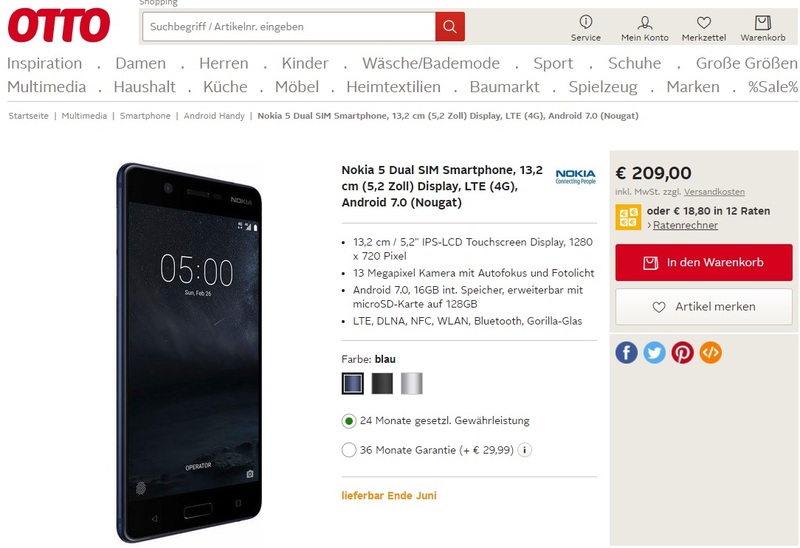 German retailer OTTO opened the pre-orders for the Nokia 6, 5 and 3 at very interesting prices. We are acquainted with the targeted pricing of the new Nokia devices that HMD presented back at the MWC2017 in Barcelona. Nokia 6 targeted price was €229, for Nokia 5 €189 and for Nokia 3 €139. The German retailer didn’t exaggerated much and raised the prices for €20 per each model, which is still pretty much OK and rather competitive. There are some Sony Xperia and LG phones that are €10 cheaper, with similar specs, but don’t have clean Android, aluminum body or great logo :). All the phones are going to be available in blue, black and silver but unformtunately OTTO is not offering copper versions which look cool. It is also nice from the retailer to offer up to 12 monthly payments for the devices. If you are interested in pre-ordering the Nokia 6, Nokia 5 and Nokia 3, just click the embedded links. To find out more about the devices search the Nokiamob :).